Sunburst Trading Company The Shell Shop is located at 148 St George Street. We are a complete Shell Shop with coral, shells- large and small and sea-life as well as specimen shells and megladon fossil shark teeth. We also carry a complete line of shell and coral jewelry and silver gemstone jewelry. We import many lines of gifts and decorative accessories from Asia and Latin America. We carry our most complete selection of Air plants or Bromiliads from Guatemala at this store. 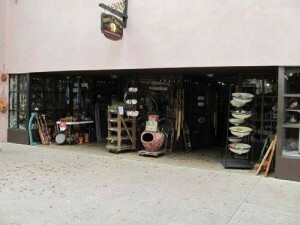 All our decorative and gift lines are also available including Mosaic Glass, Metal Art from Mexico and Indonesia, wood carvings, bamboo wind-chimes, boat furniture, bamboo root carvings, dream-catchers and much much more.